Cow spots. Dalmatian spots. Calico cat spots. Here, Spot! 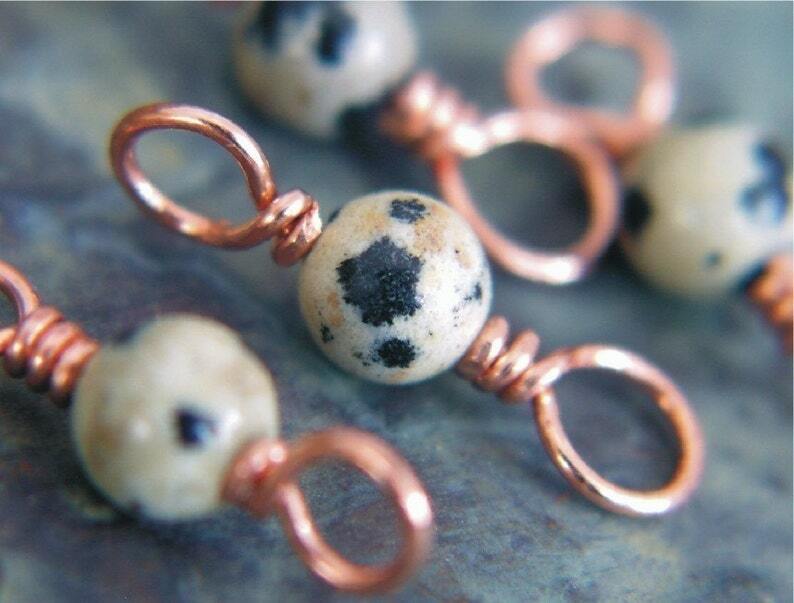 You are purchasing (4) four copper wire and dalmatian jasper stone bead knitting stitch markers. Length of one marker = just over 3/4 inch [21mm]. Small loop accommodates up to US4 [3.5mm], larger loop US8 [5mm]. Individual bead coloring varies so the spotted stone beads in the set you receive may look slightly different than the ones photographed. These stitch markers are individually hand wrapped and designed for use on two different sized knitting needles. Wire ends are carefully beveled and wrapped close to loop stem for a smooth, snag-free finish. I like the two different size ends on the same marker. It's harder to find markers to fit smaller needles without being too big or binding. These are, hands down, my favorite stitch markers. They never snag, are sturdy, secure, and, well, perfect. I especially love how thin the wire is, which never gets in the way of a sock gusset decrease. I'm sure they are the reason I never get holes in my sock gussets. Arrived quickly, even more beautiful in person!